Even when they aren’t in season, I’m not above buying and eating strawberries grown in faraway places like Florida and California. (Target, of all places, has quality berries for the best price around.) While not quite as sublime as the homegrown, in-season berries I prefer, they are usually good enough to quell the symptoms of withdrawal that pop up during those long empty months without the homegrown variety. 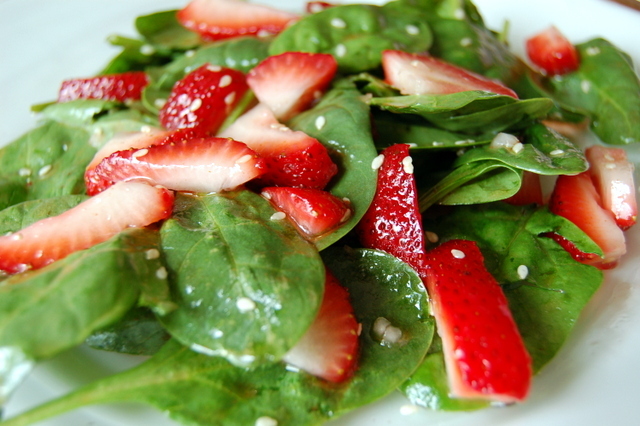 A few years ago, my sister-in-law, Rebecca, brought a strawberry and spinach salad to our family Easter dinner that transported me to a whole new level of strawberry enjoyment. With its juxtaposition of deep red berries and dark green leaves, it was as satisfying to look at as it was to eat. The humble dressing gently magnified the sweet-tartness of the strawberries. And the nutritional punch of the spinach alone was enough to cancel out the sugar load in the dressing and inject the eater (namely, me) with a small dose of self-righteousness. On that spring afternoon, I fell in love. With strawberry and spinach salad. Rebecca was gracious enough to share her recipe with me. And now I’m sharing it here, with you. It is such a quick and simple dish, and yet, every time I toss it together and serve it up, people rave and compliment – as if I really had anything to do with the perfection they are seeing and tasting. In this case, the ingredients do all the work. My only job is to help them find each other. See what I mean? It’s gorgeous. Go ahead. Give it a try….. 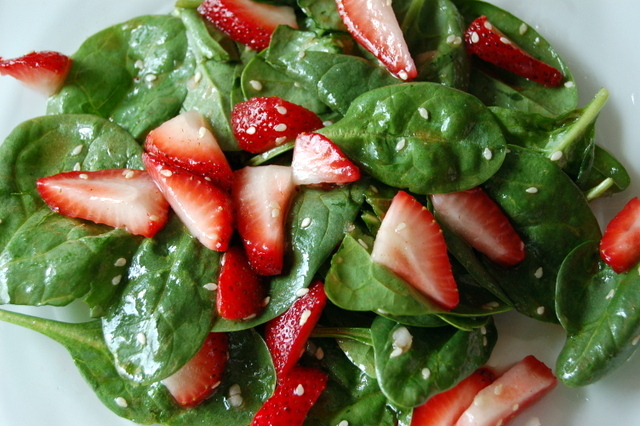 Combine spinach and strawberries. Mix the dressing together and pour over the salad. Enjoy! Note: I only make half a recipe of the dressing. For me, that is just that right amount of zingy liquid for this salad. It’s a personal preference – I don’t like my greens to be swimming in dressing. Yummm, indeed! Thanks for stopping by. I make this sometimes and put red onions in it. delicious! I’ve never tried it with red onions, just white ones. I’ll have to give the red ones a try the next time. beautiful! i’m drooling as we speak! I know what you mean. My mouth was watering as I wrote the post. I give it a try, seems delicious.